This newly designed Sundance rebounder is one of the best rehabilitation and therapeutic products on the market today! Rebounding can be either a vigorous or gentle exercise and is one of the only exercises some people are capable of doing. 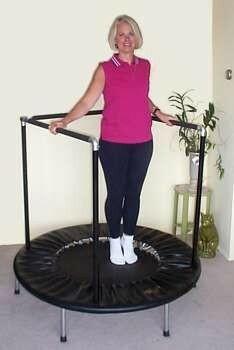 This 50" model comes complete with 36 - 8.5" springs and a safety hand rail enclosing three sides of the rebounder.